It is often said roots and wings are two of the most valuable things parents can give their children—roots to know where home is and wings to fly off on their own. There are some moms and dads who have done quite well with the first part of that directive but have had great difficulty with the second. We know them as helicopter parents, a term given to people who micromanage their children's lives, even as they enter their twenties. 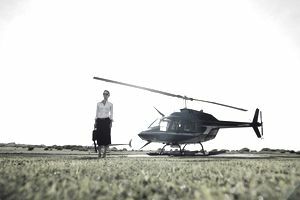 Helicopter parents, although they are in most cases well-meaning, can do significant harm to their children as they become adults and begin their careers. Children who have always had their parents decide things for them, frequently find it difficult to move forward on their own without mom and dad's oversight. They lack confidence and may not have the critical thinking skills they need to make decisions and solve problems. Parents who do not instill in their children the confidence to fly are doing them a great disservice—one that can stall their progress into independent adulthood. While it is best to start early when it comes to giving your children the skills they need to go out on their own, there are things you can do to help them move forward even if you hovered over them while they were young. As much as you may think you know your child better than he even knows himself, do not tell him what career to choose. Don't tell her she is picking the wrong career even if you think so. Instead, teach your child how to choose a career. Encourage her to get help from the career services office if she is in college or from the guidance counselor if she is in high school. Knowing how to write your own resume is an important skill. Everyone should know how to do it or how to seek out the help of someone who can teach him. If you write your child's resume for him, he will never learn how to do it himself. Never ever apply for a job for anyone but yourself. Applying for a job will empower your child and let her begin to take charge of her own career. If you happen to come across a job you think she may be interested in, you can alert her to its availability but that is all you should do. Try to imagine how it looks to an employer when a job candidate arrives for an interview with mom or dad. Will she think to herself "this is an independent human being on whom I can count to come to work on time every day and do his job" or will she think "this is someone who can't do anything without his parent's help"? It is unlikely the employer will want to hire your child if he can't get to an interview on his own. Like many early twenty-somethings, your young adult may enjoy sleeping late. That desire could interfere with her employer's need to have a worker who is punctual. The end result could be a reprimand from the boss or worse. What should you, as a parent, do? Perhaps buy your child an alarm clock but there's a good chance she has a smartphone with one installed on it. What you should not do is wake your child up each morning. She has to learn to wake up on time and arrive at work when she is scheduled to be there. That is part of being a grownup. If she can't do that, she will have to suffer the consequences and hopefully learn from them. There's a fine line between using your connections to find a job for your child and helping him build a network. If you want to teach your child how to network properly, ask the person with whom you want to connect him for permission for your child to get in touch with her. You should never share anyone's contact information without asking first. Make the introduction, but let your child do the rest, for example, send a resume or arrange a meeting. Other than under dire circumstances, for example if your child is physically unable to speak for himself, should you speak to your child's employer on his behalf. Do not call in sick for your child. Do not approach your child's boss about a problem she is having at work. Refrain from intervening in any way with her life at work.